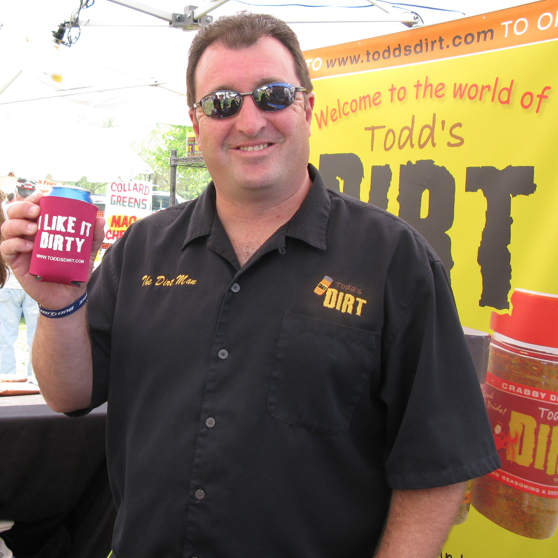 Todd “The DIRT Man” Courtney makes 3 awesome, all natural seasonings: Original DIRT, Bayou DIRT and Crabby DIRT. Wow and I thought Todd’s Bayou DIRT was good… Read how it transformed me into a Cajun seasoning lover here. Recently we tried Todd’s Crabby DIRT seasoning. It was delicious, savory, zingy… is that a word? It was superb. Keep in mind we live in the Chesapeake Bay area of Maryland, where Old Bay Seasoning is King. (Sorry J.O.) And yes, there is a Maryland company named J.O. 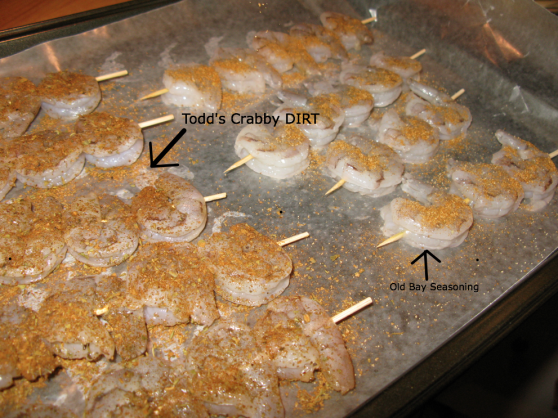 Todd’s Crabby DIRT is a strong contender for the King of seafood seasoning. The ingredients are: Basil, Oregano, Thyme, Rosemary, Kosher salt, garlic, Chipotle powder, Celery Salt, Dry Mustard, Paprika, Cloves, Ginger, Black Pepper, Cayenne Pepper, White Pepper, Onion, Sage, Cinnamon, Parsley. 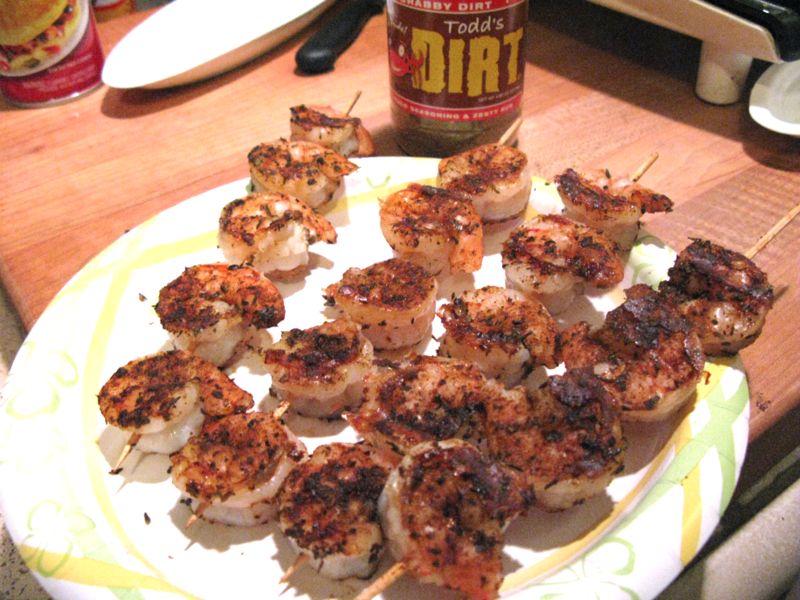 We sprinkled… well, we *coated* some shrimp skewers with the Crabby DIRT Seasoning, grilled them on our Foreman grill, and had an epiphany… this stuff is *good*! No, not just good, it’s wonderful. It is zesty, flavorful, and very much complements the seafood you put it on. Todd’s Crabby DIRT is flavorful, herbaceous, and not too salty (which is very important), so the next time we grill shrimp, we are using it. Please visit ToddsDirt.com and order all three of his seasonings… because you will NOT be sorry, I promise! And tell Todd that HotSauceDaily sent you! Thank you for the great review. Crabby Dirt is great on seafood, but equally good on Chicken, steak, hamburgers, veg’s, chili etc. There are so many ways to use it. Thanks for the DIRTY review. Looks good I would like to have that on my site. an readily digestible form, nor has the essential fatty acids, and protein shakes.